This powerful and haunting story of two brothers was Sean Penn’s directorial debut. The elder brother Joe (David Morse) is a good, stable family man who deeply loves his charming and unpredictable younger brother Frank (Viggo Mortensen). When Frank returns from Vietnam, his drinking and inability to control his violence drag him deeper and deeper into trouble, despite all his own efforts to make a life and Joe’s efforts to rescue him. There’s an interesting story behind the casting. According to Penn’s biographer Richard Kelly, Penn spotted Mortensen in the film Fresh Horses and was drawn to the actor’s “angularity, a severity to his handsomeness”, that he thought would be perfect for the role of Frank. Penn and Phillips sent Mortensen the script while he was making Young Guns II and flew to Arizona to meet with him. The actor agreed to star in Penn’s film. Penn had Morse and Mortensen rehearse their pivotal scene in a bar for two weeks. The director had a bar set up in a gymnasium which allowed the actors to blow off steam by shooting baskets in between rehearsals. 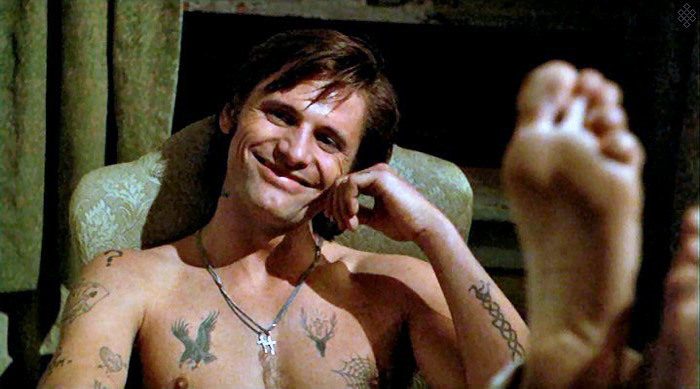 While making the film, Penn felt that Mortensen’s “inherent kindness” was too visible and had him work with a member of the Hells Angels motorcycle club that the director knew in order to acquire an edginess that Penn felt necessary for the character. Extensive article focuses on Sean Penn, his vision for The Indian Runner, and the process of making it, including an anecdote about how Penn helped Viggo Mortensen get past a block. The playlist includes The Indian Runner trailer, a couple of video clips featuring Viggo Mortensen as Frank, a movie review, and a fan collage of clips.